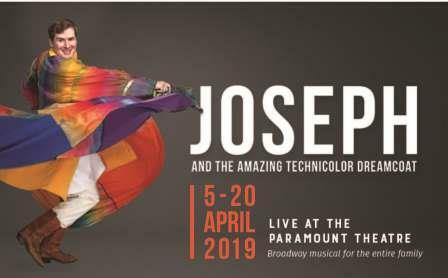 Any dream will do as this irresistible story of Joseph and his coat of many colors comes to vibrant life in this delightful musical parable. The toe-tapping score is full of unforgettable songs, including "Any Dream Will Do," "Close Every Door," and "Go, Go, Go Joseph." This is the show most requested by audiences to see again. Friday, April 5 - 7:30 p.m.
Saturday, April 6 - 7:30 p.m.
Sunday, April 7 - 2:00 p.m.
Saturday, April 13 - 7:30 p.m.
Sunday, April 14 - 2:00 p.m.
Friday, April 19 - 7:30 p.m.
Saturday, April 20 - 2:00 p.m.